Peavey. A lumberman's lever for turning logs that has a pivoting hooked arm and metal spike at one end. Pie Shape or Wedge Cut. A section sawn from a tree during the bucking sequence to allow for the directional pressures of various bind situations. Splits, slabs, and excessive wood-pulling are minimized when a pie shaped cut is sawn. Pivot points. Pivot points can be stumps, rocks or any protrusion on the ground that affects a log's balance or natural tendency to roll. An unseen pivot point may cause the ends of the log to swing around the pivot point. Plumb. To gauge or assess the various vertical leans of a tree as part of the sizeup completed prior to felling. Plumb bob. 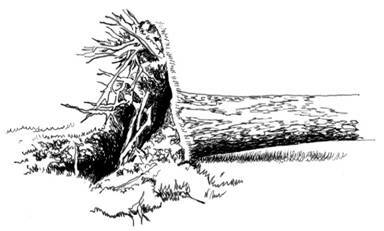 A tool used to establish the outward lean or slant of a tree in relation to its base. Generally a weight attached to a string. PPE. Personal Protective Equipment for eyes, head, and extremities, protective clothing, respiration devices, and protective shields and barriers. In addition to PPE required for fireline duties, sawyers and swampers are also required to use approved chaps, eye and hearing protection. Progressive Method of Line Construction. A system of organizing workers to build fireline in which they advance without changing relative positions in line. Pull-in. Pull-in occurs when the chain on the bottom of the bar is caught or pinched, and suddenly stops. The chain pulls the saw forward. Push-back. Push-back occurs when the chain on the top of the bar is suddenly stopped by contacting another object or by being pinched. 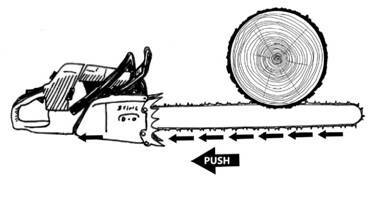 The chain drives the saw straight back toward the sawyer. Pusher or Driver. 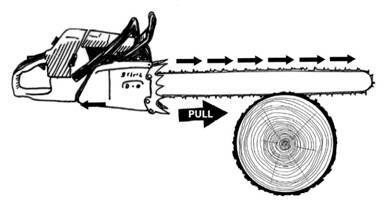 Use of a tree to drive or push over another tree that has not completely fallen to the ground but has been faced and backcut. This is a forbidden technique for fireline operations. Machines should be used to mitigate this hazard. Root Pull. The pulling out of a portion of the tree's root system. 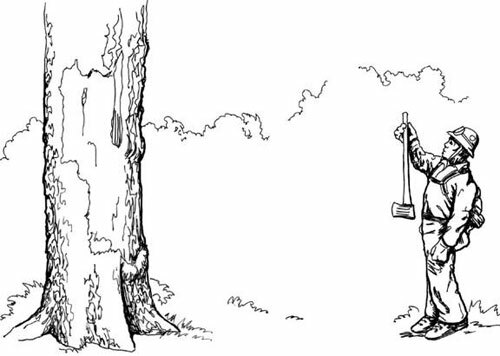 Commonly a result of not cutting up the corner of the holding wood close enough on a large or heavily leaning tree (common on soft or saturated ground). Root Wad. Mass of roots and dirt which projects above ground level after a tree has been pushed or blown over.